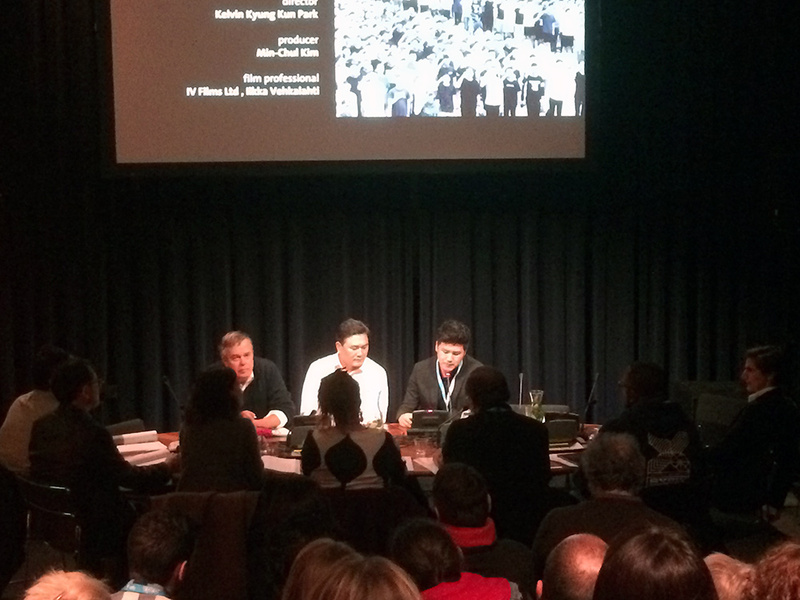 The 2015 IDFA Forum: A Reassessment of "The Mother of All Forums"
On the first day of the 2015 IDFA Forum (November 23 – 25) one of Europe's most important international co-financing and co-production markets for documentaries, an article appeared on the front page of IDFA's "Industry Special" newspaper entitled "Mind the (funding) gap." If filmmakers and industry had taken time out from the endless parade of Forum pitches, meetings and parties to read the piece, they might have packed their bags and headed home. In the piece, both Nick Fraser, editor of BBC Storyville, and Paul Pauwels, European Documentary Network (EDN) Director, express deep concern about the current funding situation. Fraser describes it as "a real crisis in documentary funding among broadcasters," with Pauwels adding, "If you compare it with 15 to 20 years ago, it is a completely different world, and it has to do with the lack of respect for documentary within the broadcasters." However, in spite of these dire warnings, Fraser, Pauwels and hundreds of other industry leaders and filmmakers forged ahead with the 23rd edition of the IDFA Forum. Through interviews with different participants in the Forum, including several industry representatives and filmmakers, we used the opportunity to re-assess the viability of the Forum: Is it still important? How has it evolved to stay current? On balance, do the filmmakers who participate benefit? Sixteen producer/director teams are chosen for the Central Pitches, which are exclusively for projects that have raised at least 25 percent of their financing. The projects are pitched in front of a large group of commissioning editors and other decision-makers, with over 300 observers watching from bleacher seats; the Round Table sessions consist of projects in all stages of development and funding that are pitched to a smaller group of commissioning editors and decision-makers and in front of an audience of approximately 75 observers; four Rough Cut projects, in the last stages of production, were chosen to participate in this new section, which also represents a unique partnership between the Forum and the Docs for Sale, IDFA's robust market for completed films that takes place during the Festival. Unlike the other projects, the Rough Cut filmmakers do not pitch at the Forum itself, but are invited to upload a pre-recorded pitch at the head of their rough cuts, which were made available to all registered industry for the Forum and Docs for Sale. In order to gain a broad perspective of this year's Forum, we interviewed several key decision-makers: Rudy Buttignol, who has served as one of the Central Pitch moderators for six years, and prior to that participated as a commissioning editor; Nick Fraser, editor of BBC Storyville; and Mette Hoffman Meyer, head of documentaries for DR Danish Broadcasting Corporation; as well as the following filmmakers: Min-Chul Kim, producer of ARMY: 600,000 Portraits, one of the Round Table projects; and directors Ivan Osnovikoff and Bettina Perut and producer Maite Alberdi from Los Reyes, one of the 16 Central Pitches. 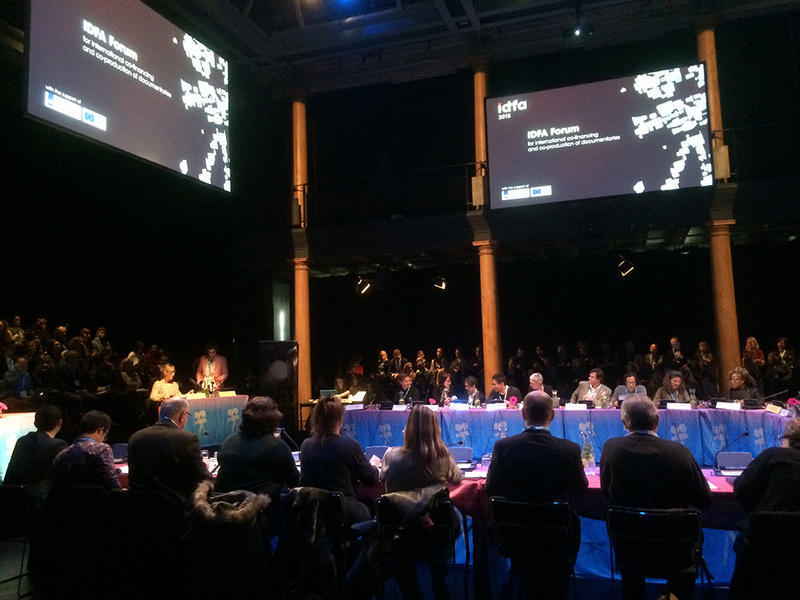 According to Buttignol, who is in his 21st year at IDFA, IDFA is "the mother of all forums around the world." Its combination of innovations set it apart and paved the way for a legion of imitators. These innovations included: (1) having commissioning editors and funders sit around a three-sided rectangle, with the fourth side open to accommodate two tables—one for the pitch team and one for the moderators, with observers arranged in bleachers around them; (2) requiring that the projects being pitched already have some percentage of funds already in place; and (3) requiring that every project have a commissioning editor attached to the pitching team. In this way, commissioning editors play two roles: They pitch projects and they field everybody else's projects. "Those were the missing components that really made it click," says Buttignol. Since then, many others have followed this basic format, with some variations. Buttignol himself was key to bringing the Forum format to Hot Docs in Toronto. Buttignol feels that, even with so many other forums around the world, Amsterdam is place to be in terms of getting the pulse of the documentary world. "I tell everyone trying to get a handle on the international market," he maintains. "Some things you should visit every two, three years, or maybe once in a lifetime, but Amsterdam, you should be there every single year. In the Central Pitches, you will get enough buyers and sellers pretty much representing the world scene." For those observing the Central Pitches, "You'll get an idea of the difference between individual commissioning editors' personal tastes, the brief of their channel and what it feels to different countries," says Buttignol. "You'll get a tremendous amount of market intelligence that's very accurate at the moment that you'll never get anywhere else." Another special aspect of the IDFA Forum is the truly international nature of the gathering. "You'll never get as broad a representation anywhere than here," Buttignol notes. "Because of huge EU funding, they have to favor EU projects, but they leave a large section open for projects from around the world. They're quite diligent about it." Buttignol's statements are confirmed by the numbers: in 2015, 59 projects, representing 31 countries. Echoing Fraser's and Pauwels' contentions regarding the diminishing power of commissioning editors to commit funds to projects unilaterally, Buttignol comments, "I think at one point the CEs had a lot more autonomy to go out there and buy creative documentaries. I think, as everywhere, people tend to commit to projects conditionally." So, which films tend to do better pitching around the table? According to Buttignol, "The films that are really cinema documentaries with a sidebar of TV are the ones that are less successful around the table. If there's a theatrical release to it, but it has a viable television aspect, it'll do OK. If it's strictly for cinema and, 'Oh, by the way, can you give me some broadcast money for it? '—those things have kind of gone away." Another change relates to the sub-genres that one now sees in Amsterdam: "It used to be all social issue; now we get a lot more arts and culture projects, which is great." Perhaps the most critical aspect of the IDFA Forum (and the Festival), is the role it plays in supporting filmmakers' careers in the long term. "Every year, you'll see the number of projects that have been pitched here, that are back here as finished films, and you look at the broadcasters that are involved and you'll find that that's the direct response [of having been pitched here,]" Buttignol explains. "But a lot of times, if you look at it five and ten years, you'll see that the people who pitched, who may not have had a successful project, are doing their next project with a variety of the broadcasters. In other words, they may not have been successful pitching their project, but they were successful at pitching themselves as credible." After 21 years of coming to Amsterdam, Buttignol has not lost his enthusiasm for IDFA: "The folks here in Amsterdam have done two things: first, they've stayed true to their original mission of supporting documentaries; the other thing is they've stayed current. They do a great job and that's why I keep coming here." Hoffman Meyer: There are many pitch forums, and, to me, they're very important for all the filmmakers because they can sit with all these different foundations and broadcasters and hear what they think and what they feel, and if they like the projects or not, or if it fits into this channel or that channel. That way it actually saves all of us a lot of work because they would know that this kind of film doesn't fit DR, or maybe it fits ZDF. I prefer going to places where it's no pretense of being a market. If you go to Korea or Japan, people want to hear from you because they want to find out things. Here, it's sort of a hybrid; it has the pretense of being a market and it's pedagogic, too. The whole point is to discuss with people what they think is important, not what you think is important. Hoffman Meyer: It depends on the character of the thing. If you have a big idea, if you pitch a film that could fit in all markets, then you might miss out on some funders (in the smaller Round Tables), but yes, it's nice to sit and discuss. It takes a lot of money to come here and six months or a year to prepare, and there are only three people with money in that little room. Hoffman Meyer: It takes time. People say, "I'm interested." It doesn't mean that you get money. Foundations could take years before you get money. Hoffman Meyer: In all the institutions there's a lot of fear. There are new things called "zero failure policies." A lot of the people sitting around the table have no decision-making capability; you can have people who are really enthusiastic and like it, but then they don't get it through with the program management. You have to know all these things as a filmmaker. Fraser: Mette's just about the only person, and myself, to some degree, that if we say, "We'll take it," then it gets taken—and Axel [Arno, commissioning editor at Swedish TV]. There's only Scandinavians and us, really. Fraser: "[referring to a filmmaker sitting at their table during our interview] His most difficult films could be funded 15 years ago in their entirety; he showed up with a project nobody knew about, with a budget of $6 million, and it could be funded in its entirety by end of the pitch. That's just not happening now. But that doesn't mean the Forum is less important; in a way, the fact it takes far longer to raise money means these forums remain very important, but for different reasons. They're like conventions of consultants. They're not important purchasing moments. Fraser: I'll have an argument with the BBC and they'll say, "Why would you want to do another Chinese film?" And I'll say, "Well, actually, it's a real cool subject. It's about the Internet, and we always do very well with films about the Internet." So everyone will say, "Yeah, that's fine," and then we'll invest in it. Mette has more autonomy than I do. The BBC is top-heavy. Hoffman Meyer: If you take The Road, which is in the festival here, the Chinese film. It was pitched to me in Taiwan, and I really liked it. And backed it, and we got here, and I pitched it with the filmmaker, and he got some pre-sales—not enough, so he still didn't have enough to finish it. Then I got some Danish organization that had some money for Chinese culture, and they paid for his editor to go to Beijing and cut for five weeks and then we finished it in Copenhagen with the director there. So that's also how these independent filmmakers in countries where they don't have any backing can find their way to finish. Now it's in competition here, so he's really happy. 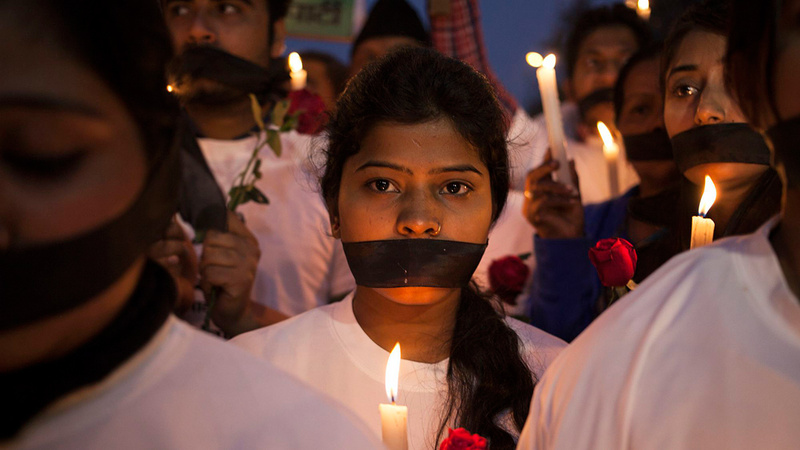 Fraser: Two years ago, we raised nearly all the cash for India's Daughter. There was a closed pitch because of the nature of the material. We invited people and they showed up and when the thing was finished, we had all the money, pretty much. Hoffman Meyer: I would think that happens nine out of 10 times. People are polite here, then they go back to all the bureaucracy. Hoffman Meyer: That happens all the time. When you read the book on the plane and you think, "This sounds good, or this is not good." Then when you get here and you meet the filmmakers and see the footage, you change your mind completely. Fraser: That's why I don't read stuff beforehand. I listen and then check that against what they say. Min-Chul Kim is a Seoul-based filmmaker who has produced several award-winning documentaries, including Iron Crows (2009), 9 Muses of Star Empire (2012), and Planet of Snail (2011), winner of the 2011 IDFA award for Best Feature-Length. He is also the founder and CEO of Doc Air, an international distributor that specializes in distributing Asian documentaries by Asian filmmakers worldwide. Because of Kim's combined experience—he's pitched several times at the Forum; screened several films in the Festival; trained other pitch teams in different settings; and, now with his new company, has the industry perspective as well—he sees the Forum through several different lenses. ARMY: 600,000 Portraits is, according to the Forum Catalogue, "A film depicting the emotional experience of being in the South Korean Military, and how it shapes our national identities." Director Kelvin Kyung Kun Park is a multimedia artist and documentary filmmaker. The film's total budget is just under €400,000 and needs €371,000 for completion. As participants in one of the Round Table pitches, Kim and Park, like all of the other filmmakers participating in the Central Pitches, Round Tables and Rough Cuts, have the opportunity to request one-on-one meetings with a certain number of commissioning editors, funders and decision-makers. Those industry personnel also have the opportunity to request meetings with a certain number of filmmakers. It is then the IDFA Forum staff's daunting task to play matchmaker and try to put these two groups together. Because of the nature of ARMY, which is described by Kim as being more auteur-style than character-driven, the filmmakers chose not to invite any broadcasters to one-on-one meetings; they mostly invited international film institutes and some distributors. To Kim's surprise, some broadcasters asked to meet with him. Kim has learned through experience how to temper his expectations and where to put his time and energy. "It takes pitching several times and going through the process all the way through distribution to know how it works," Kim notes. "Now, I understand better. We already pitched at Sheffield, Sunnyside and other places so I knew we weren't going to come back with the cash. It's a long process." Echoing what others said, he agrees it's not just about the money: "With Planet of Snail, the Forum didn't get money for the film, but helped give great exposure to it and reassured financiers already on board." Kim adds that, while he has had co-production agreements on his films before and is at IDFA seeking a co-producer on ARMY, "Co-productions aren't for everyone." He also feels there are several imbalances between European co-producers on the one side and Asian filmmakers on the other. For example, Asia is lacking a fully mature system for documentary funding and distribution compared with Europe, and there are cultural differences that effect deal-making as well. "In Asia, modesty dictates that you ask for less," he explains. "In Europe, the culture dictates that you ask for more." Kim advises filmmakers to make sure that the co-productions that they enter into not only make sense financially, but also creatively: "You need to have good creative relationships. This is discussed much less than financial relationships, even though the creative relationship is dictated by the co-production rules." For example, the co-production agreement might require a filmmaker to work with an editor or DP in the co-production country, but this may not be the right person for the film. In the end, Kim sees great value in the IDFA Forum, but cautions putting too much emphasis on the decision-makers: "I understand why they call them 'decision-makers,' but, at the end of the day, it's filmmakers who are the decision-makers." On the first morning of the Central Pitch, the Chilean team of Ivan Osnovikoff, Bettina Perut and Maite Alberdi pitched their documentary feature Los Reyes, which, according to the Forum Catalogue, is, "The story of four low-income teenage skateboarders that embody the challenge of becoming adults in a segregated and classist current-day Chile." Alberdi is an experienced producer/director best known for her 2014 film Tea Time; Osnovikoff and Perut have worked as a directing team for years, completing numerous feature documentaries together. They are Alberdi's former teachers and now, in this first collaboration between the three, Alberdi is stepping out of her director's role to produce the film with them. Los Reyes has a total budget of €279,000 and comes to the Forum seeking €150,000 in finishing funds. The Central Pitch consists of a seven-minute presentation, including time for a trailer of up to three minutes, followed by an eight-minute Q&A with the commissioning editors around the table. From beginning to end, the Los Reyes team's experience is, in many ways, the picture of a Forum success story—and, quite possibly, for that reason, a bit of an outlier. Early on, they set their sights on the Forum. Once they were accepted to the Central Pitch, they were able to make the time necessary to prepare diligently; took advantage of the training opportunities made available to them by the Forum; executed a polished presentation; and received both financial support and useful feedback during the pitch itself. From the beginning, the team felt the Forum should be a part of their funding strategy. According to Alberdi, "Applying was always in our plan because the Forum is a very important platform to have visibility throughout the world. Even if you don't get anything here, when you finish the film, it's well known." Once accepted, the team put a great deal of resources into preparing: They recut their trailer and hired an English language teacher to help them with their presentation (the pitches are all in English, regardless of the native language of the pitching team). Once they had a draft of their script and a cut of the trailer, they sent both to the European Documentary Network (EDN) trainer that the Forum offered as a resource. According to Perut, "This training was very important for the film. This one was better than other training because they really looked at it and gave us comments three weeks ago. It's at a higher level." Prior to getting accepted to IDFA, they had a trailer, but as Perut describes it, "Now with the heat on, [we decided] to have the best trailer possible, so we did a new version." According to Osnovikoff, one key to preparing the text of what they were going to say was not to change too much from the materials they submitted to IDFA originally: "It's important to recognize that, if your project was selected, it's because something is working, so it's not necessary to change everything for this performance. Of course, you need to re-edit your trailer and write shorter text for pitch. Maximum two pages." Alberdi also feels that in preparing the text, you need to keep in mind what is important for the film in the long run, beyond the Forum: "It's important to make the pitch not just for here, because it's the way to ask yourself what is working for the film and what is not working. It's also a good way to develop the characters, script and production. It's good feedback, regardless of whether you get the money." Then, once the text was written, they memorized it. For Alberdi, it was important that they have it memorized so that they wouldn't be reading from a text, and could make eye contact with the people around the table. After memorizing the text, they rehearsed it many times, being sure, with help from their English language teacher, to put the correct emphasis on each word. So, what were their expectations going into IDFA? "We were hoping to have total visibility and become known throughout the industry," Alberdi maintains. "Then, we were hoping to get some international funds or co-productions; it would be great. But we assume our style, our kind of project, that the best thing that we can get from here is the international visibility. We work a lot with international funds more than broadcasters to finance our films because we have films that are in a style that's difficult to fit into broadcasters." Whether they met their goals seems to have been answered as soon as they finished their pitch. The first person to respond was Jose Rodriguez of the Tribeca Film Institute, who said, "What we're looking for are, first and foremost, stories that deviate from the stereotypes that keep being propagated about Latin-American culture, and I think this is a great fit, so I want to commit to giving you guys a grant this cycle." While, of course, this decision would have been made prior to the Forum, the Forum provided Tribeca and the Los Reyes team with a high-visibility platform for this important grant to be announced. Several commissioning editors had questions about the way GoPro footage seen in the trailer would be used in the finished film. However, even this was something the team had anticipated. "We know what things we didn't put in the presentation—for example, the artistic approach—so we knew the question about the camera style would be asked, and it was," Alberdi explains. There is little doubt that the Forum's creative, lingering effects will be every bit as fruitful as the preparations that led up to it. While not every team can expect to be as successful as the Los Reyes filmmakers in meeting or exceeding their expectations, it's striking how much their thorough preparation and strategic approach matches the advice from experienced commissioning editors. Below is a list of tips from the three commissioning editors interviewed for this article. Know your story. The most successful pitches are the ones where the filmmaker knows the story. Be short and pithy and entice people into a conversation. When you're pitching somebody, you want to give them enough where they're so interested that they ask you, "And then what happens?" That's the art of it. The quicker you get into a conversational mode as two human beings, the more likely you will both be heard. Pitching is a communications function, which has two parts: reception and transmission. In other words, part of successful pitching is listening, so you've got to do both: you've got to transmit your idea and then receive the feedback. Show your trailer early on. Never read from a piece of paper; just talk to the back of the room. Write good copy; 95 percent of proposals are badly written. You shouldn't read the same thing that's in the Forum Catalogue. Tell us why you want to make the film. Be passionate. Tell us why it's so important for you to tell this story. In the second installment of our article about the IDFA Forum, read about the Forum's new Rough Cut section as seen through the eyes of the HAVEABABY team of Amanda Micheli and Serin Marshall.